Bring a Game, Win a Space Shuttle Pinball! It’s hard to believe that the Southern-Fried Gameroom Expo is less than three months away! We’ve got everything lined up to have a great time here in Atlanta: a great venue, challenging tournaments, awesome speakers, fantastic vendors, and more. However, there is one integral thing we need your help in order to have an amazing first show: GAMES! That’s right, this event will only be a success if we have plenty of games on hand for people to see and play! Our minimum goal has always been to have a minimum of 100 games at the Expo, however, we know we can do better than that! We know that the great collecting community in Georgia and beyond will do everything in their power to ensure this show will be a success in our inaugural year by bringing some incredible games to be played at the show. Treat this like a car show – what’s the coolest/rarest/most fun game in your collection? Bring it to the Expo and show it off for the world to see! We’ll be giving away prizes like signed flyers, t-shirts, and more, for “Best in Show” and other accolades. And don’t forget, we have bring-a-game rewards. The first game you bring earns you a discounted ticket, the second gets you into the show for free, and if you bring four or more you’ll be rewarded with access to our exclusive VIP event! 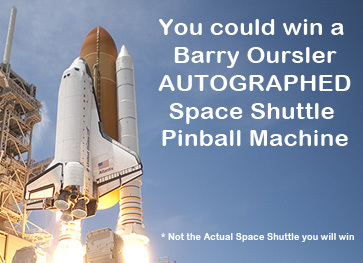 We are also pleased to announce that for every game you bring you will be issued a raffle ticket for a chance to win a very nice Space Shuttle pinball machine signed by the game’s designer Barry Oursler! The more games you bring, the better your chances of winning! The list of games is growing, so let us know what you plan to bring in June – the more games, the more fun! We’ll be bringing our personal games, and we know we can count on you to do the same in order for the show to be a success and return in 2015. Thank you for your support, it means the world to us! What are you waiting for? Tell us what you are bringing to the show.